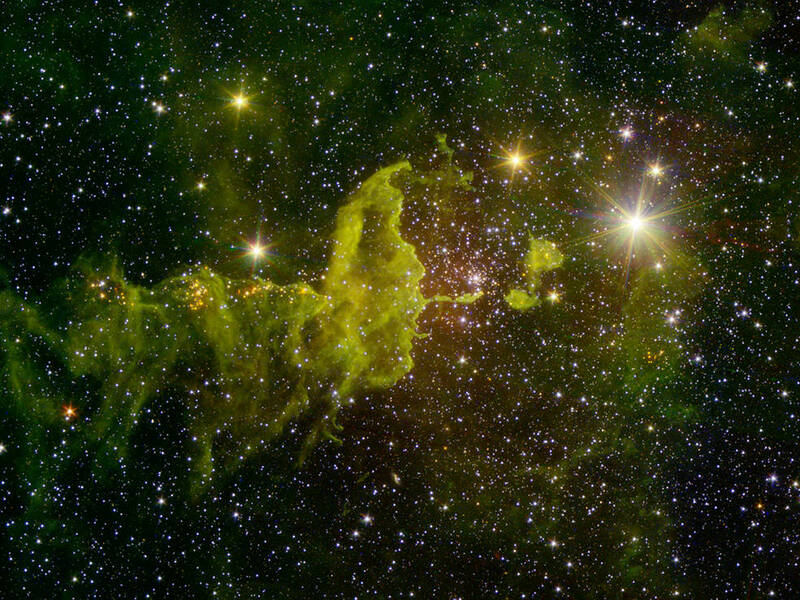 April 16, 2016 – A nebula known as “the Spider” glows fluorescent green in an infrared image from NASA’s Spitzer Space Telescope and the Two Micron All Sky Survey (2MASS). The Spider, officially named IC 417, lies near a much smaller object called NGC 1931, not pictured in the image. Together, the two are called “The Spider and the Fly” nebulae. Nebulae are clouds of interstellar gas and dust where stars can form. JPL manages the Spitzer Space Telescope mission for NASA’s Science Mission Directorate, Washington. Science operations are conducted at the Spitzer Science Center at the California Institute of Technology in Pasadena. Spacecraft operations are based at Lockheed Martin Space Systems Company, Littleton, Colorado. Data from 2MASS and Spitzer are archived at the Infrared Science Archive housed at the Infrared Processing and Analysis Center (IPAC) at Caltech. Caltech manages JPL for NASA.